Whew! I am finished with this 30 day challenge; this was a nice little journey I took and I hope you’ve enjoyed reading my posts. 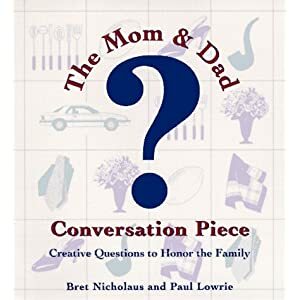 I had to look hard through my copy of THE MOM AND DAD CONVERSATION PIECE by Bret Nicholaus and Paul Lowrie, in order to find my last question. So without much further ado, I bid you adieu on this challenge! Day 30 Question 30:When you were a very young child, what did you want to be when you grew up? When you were in high school, what did you think you would be doing for a living someday? Answer: From the time I learned about words, I gravitated towards writing when I first began school. I also loved to draw so I was never without paper and pencil. My favorite subject in school was always the language arts; I quickly fell in love with reading and I read everything I put my hands on. Back then my favorite TV show was THE LITTLE HOUSE ON THE PRAIRIE. So I wrote a story based on the characters, and I set them in present time. All through middle school and high school I wrote all the time. In the 10th grade, a friend of mine had a big crush on this guy and she loved my poetry. She had me write her crush several poems which she gave to him. Writing was my friend because I was a pretty lonely kid and I trusted my journal to keep all of my secrets. I could envision myself being a writer when I was very young. In high school I discovered the seamstress in me. When I was younger and my Abuelita lived with us, I would never tire of watching her sew. When I found out I could take Fashion Design , I was in! I loved making a new outfit and getting compliments on it at school. One time I made a dress for my aunt which she actually wore often; I realized that was her way of showing me she approved my work. I also made a couple of outfits and I was able to model them myself in the yearly Fashion Show. That fueled my desire to stick to fashion and pretty soon, I pictured my self owning my own designer boutique. I went to college to learn fashion design. Once in the program though, I saw it was more of a challenge than I had previously imagined. Some of that passion I’d felt for fashion before began to wane. Then in my last year of college I enrolled in a fashion journalism course and I fell in love with writing all over again. I knew then for sure, that writing and I would never part ways again. What a lovely and inspiring post!